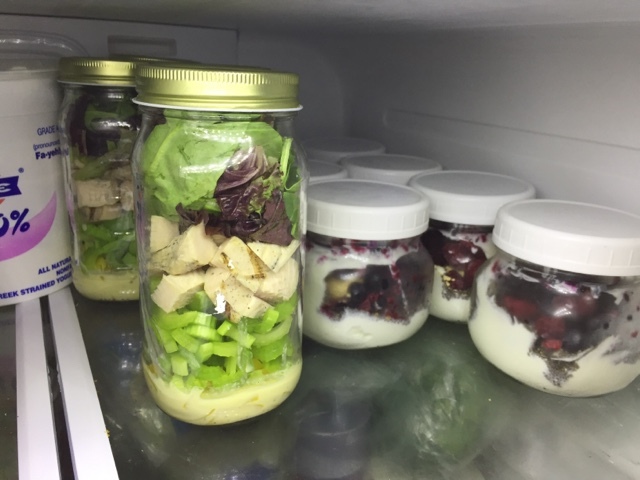 Here are three more mason jar salads I've made. Kyle isn't a fan of fruity salads, but I kinda like them So I haven't over done them but I'll try one every now and then. Make dressing: combine vinegar, oil, mustard, and tarragon in small bowl; whisk. Evenly divide dressing into bottom of four jars. 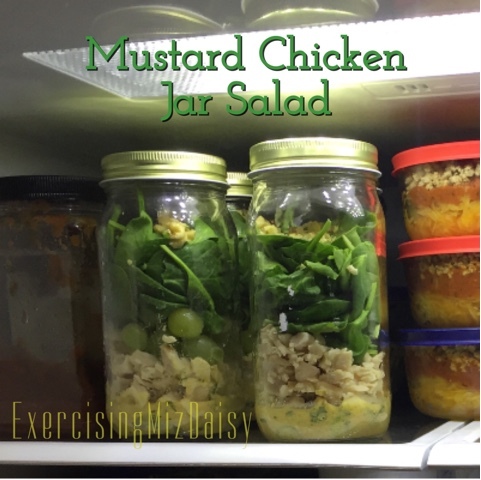 Compile salad into jars: Evenly layer celery, chicken (red container into each), grapes (1/2 purple container), spinach (full green container in each), and walnuts on top. Cover and store in fridge up to three days. Shake before serving. Place mustard, vinegar, lemon juice, garlic, peppers, salt, and oil in small jar. Screw on lid and shake to combine. 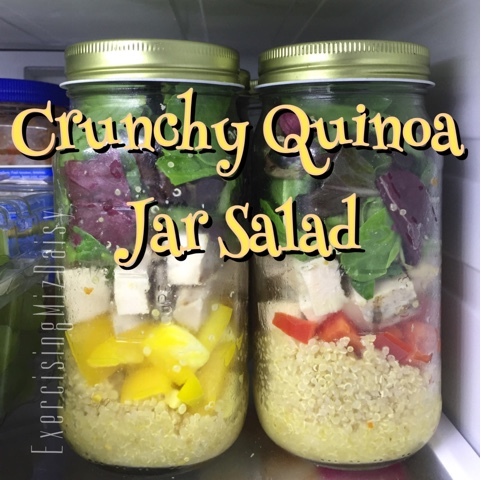 Place 1/2c quinoa in each jar, pour 2 Tbsp of dressing into each jar, shake to mix up. Next layer 1/2 c bell pepper, 3/4c chicken, and 1 cup salad greens. Cover and refrigerate til ready to eat. Enjoy within a week. I used this AMAZING dressing! It's made with an egg yolk so make sure you consume within five days. 1) Put 2 Tbsp dressing into four separate jars. 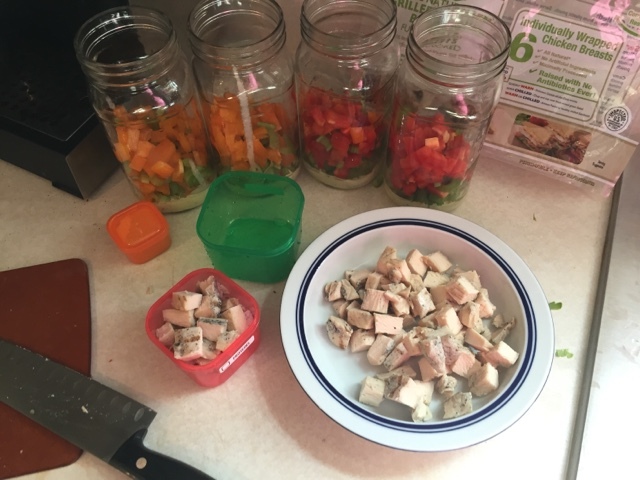 2) Chopped up bell pepper and celery (or whatever crunch you might have) I used a half a cup each for the first batch and 1/4 c bell pepper + 3/4 c celery for the second batch. 3) Add in a red container of diced chicken. I discovered a new cooked chicken at Costco I love better than the other stuff, just be sure to rinse and pat dry before using. They are individually wrapped and stored with some goop. 4) Stuff in a cup worth of mixed greens!